Stalleo's Bodyguards are the personal guards of Stalleo, a member of the family which initially owned and lived in Treva's Watch in The Rift, which is now overrun and crawling with bandits. This happened when Stalleo and his bodyguards were away to help out in the war, rendering them unable to defend their home from the invading bandits. Now the bodyguards, along with Stalleo, can be found at Stalleo's makeshift campsite, just a short distance northeast from Treva's Watch. They will stay with him while he waits for mercenaries that he hired to clear out his home, so he can reclaim it and reunite with his family inside. 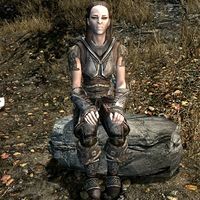 This Bodyguard is a female Nord bandit who is usually found sitting on a boulder at Stalleo's campsite. She wears a set of randomly determined heavy armor, including a pair of boots, a 50% chance of a pair of gauntlets, and a 50% chance of a helmet. All of her armor can be up to steel plate quality at level 18. She is equipped with a leveled one-handed weapon of any type, which has a chance of being enchanted, and a leveled shield, both of which can be up to ebony quality depending on your level. She also carries a steel dagger (which she will use should she be disarmed in combat), and a considerable amount of gold, ranging from 50-250 gold, depending on your level. 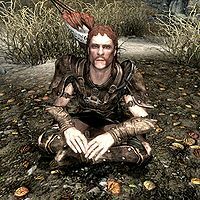 This Bodyguard is a male Nord bandit archer who is usually sitting cross-legged on the ground at Stalleo's campsite. He wears a set of randomly determined light armor, including a pair of boots and a 50% chance of a pair of gauntlets, but with no helmet. His cuirass, boots, and gauntlets may not be a matching set, as it can be a mixture of fur, hide, studded, leather, or scaled versions, depending on your level. He is equipped with a leveled bow and 20 leveled arrows, with a 15% chance of carrying an extra 6 arrows. He also carries a leveled dagger, which he uses in close combat should the need arise. All his weapons can be up to elven quality at level 20 (with the exception of the 6 extra arrows, which can be of daedric quality at level 46). He also has a 25% chance of carrying 1-9 gold, as well as random leveled loot, which includes common inn food, lockpicks and, albeit a very small chance, gems and jewelry. Stalleo: "Those bastards. I return from the war to find my home overrun with bandit filth." Bodyguard #1: "Help will arrive soon." Bodyguard #2: "Agreed, we can't afford to try again." The bodyguards also do not seem to go to sleep at night despite having bed rolls in their tents. Instead, they will sit around the campfire throughout the entire night along with Stalleo. Nearing completion of the related quest, after pulling a lever that raises the castle's main gate, Stalleo and his bodyguards will rush in and jump into the fray, helping you to kill the remaining five bandits patrolling the courtyard. When all of them are dead, Stalleo will thank you and remark that he and his bodyguards will begin searching for his family after a quick restock. The appearances of Stalleo and his bodyguards are randomly generated; they may look different in each playthrough. After the related quest has concluded, Stalleo and his bodyguards will return to their campsite and remain there for the duration of the game, leaving Treva's Watch to eventually respawn with a new group of bandits. This page was last modified on 3 September 2018, at 23:50.